Wichita is an important hub for rail trade. 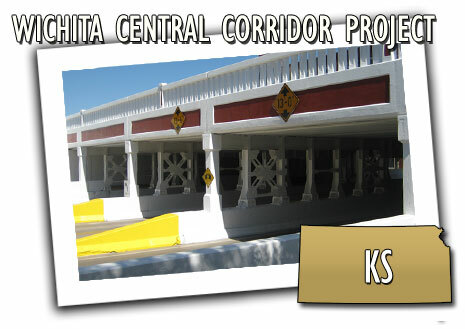 Before the Kansas DOT began the Wichita Central Corridor Project, trains bisected the downtown area each day, causing drivers a 30-minute delay with each passing train. To reduce traffic congestion, the city developed a plan to separate some of the key crossing grades. The $105 million project raised two miles of track above the roadway, providing five new bridges to carry trains over the five arterial streets below. This allows traffic to pass freely below the tracks, improving safety and reducing vehicle emissions. The reduction in traffic congestion has also reduced the number of accidents that had once been a major issue for the city. On a larger scale, this improvement removed a major obstacle to economic development in downtown Wichita, sparking new growth that will benefit the entire city.